Many people who read this will know that Invincible’s creator, ‘Robert Kirkman’, was the creator of ‘The Walking Dead’. 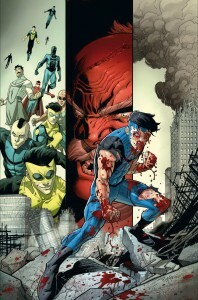 I admit I am a fan of his, and I have to boost Invincible for Kirkman lovers and fans of The Walking Dead. Invincible was first published back in 2003, however this was not his first appearance. He first appeared in the little known ‘Image Comics’ production ‘Tech Jacket’ before getting his own self-titled series. 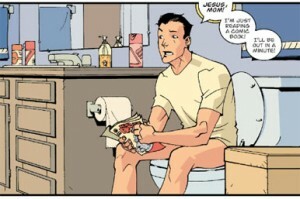 With Marvel and DC pretty much having ruled the roost when it came to Super Heroes, at first it was hard to see where a graphic novel such as Invincible would fit into the picture. Although Mr Kirkman worked wonders on the characters and the storyline, he also manages to fit in a few not so subtle parodies aimed in the two mighty behemoths’ direction – a tip of the cap as it were to all those who went before it. These can be easily seen in ‘The Guardians of the Globe’ (Justice League) or ‘DarkWing’ (a Batman parody) whom we first meet in a city without sunlight, which the American government urged and or paid for everybody to vacate the city, turning it into a ‘No Man’s Land’ like ‘Gotham City’ was for a period. However these are but mere glances at works that have gone before Invincible, the main storyline and the characters are well fleshed out and for a Super Hero story as believable as can be. The story itself revolves around a teenage boy by the name of Mark Sebastian Grayson, son of Nolan Grayson (Omni-man) one of the greatest super heroes earth has ever seen, and his mother Deborah Grayson. It starts very early on with Mark getting his powers, something which he has been waiting for for some time – having been told by his Dad that he may get them when he grows up. Of course having ‘Omni-man’ for a father, the first thing that Mark wishes to do is fight crime. At the start he finds it rather easy. He falls in with a small super-hero team and enjoys himself, whilst continuing to attend high-school and deal with a part-time job. Then after an event happens, a dark secret gets revealed; things all begin to change and take on a much more serious edge for Mark. Whilst I do talk of seriousness and dark secrets, you should be under no illusion; this graphic novel does know how to not take itself too seriously, though still delivering good well-paced storyline. The two artists who helped Kirkman create this masterpiece are one ‘Corey Walker’, best known for his work here, ‘Spiderman’, ‘The Punisher’ and ‘Destroyer MAX’, the other ‘Ryan Ottley’ was found by Kirkman himself as Ottley was working on the webcomic strip: ‘Ted Noodleman: Bicycle delivery boy’. 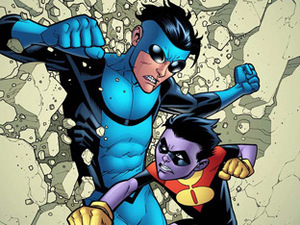 Upon seeing his work, Kirkman offered him a job to work with him on Invincible. Both artists are extremely capable, and it is shown in their artwork. There are some people who dislike gore/violence in their graphic novels. I believe if it is not overdone, it can add to the drama and tension of a storyline. I always disliked (in anything I watched or read) the hero being thrown through buildings, or taking bullets, and shrugging them off as if they were merely inconvenienced and there being no physical sign of damage to the man/woman in question. As the picture above shows, this is not a problem you can expect to encounter in Invincible. I believe the line is well trodden, and never has a problem with showing severity where needed. In conclusion, if I were to be pushed, I would actually rate Invincible higher than Kirkman’s runaway hit ‘The Walking Dead’. I would much have preferred a television series and game to be made of this. However producers need to go with what sells, and following the poor sales at the beginning of Invincible I am not surprised it went Walking Dead’s way. If I were a person who didn’t know whether or not they wished to buy this graphic novel then I suggest reading other peoples reviews – they are all over the internet and nearly all glowing.